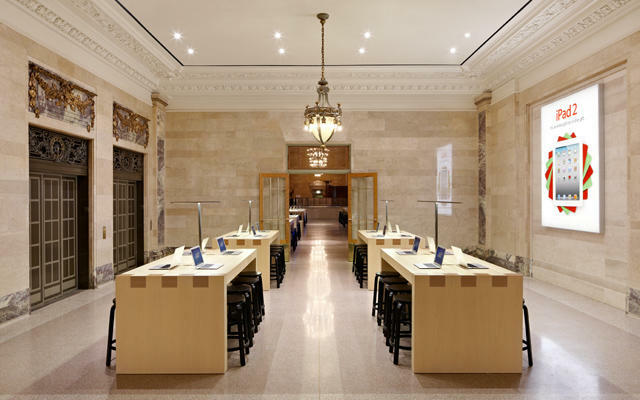 An audit conducted by the office of New York State Comptroller Thomas P. DiNapoli has found that Apple was granted an "inside advantage" to open its Grand Central Apple Store location in New York City. DiNapoli's office argues that Apple didn't have to go through a "supposedly competitive process" in order to gain the highly sought-after space inside the massive train station. Instead, DiNapoli argues that the Metropolitan Transit Authority (MTA) worked with Apple "behind the scenes" on the lease before it even asked other companies to submit proposals for the space. "While Apple may turn out to be a good tenant, the MTA set a troubling precedent when it played favorites and gave Apple a competitive edge over others for the Grand Central space," DiNapoli said. "Apple was directly involved in setting the terms of the lease and given exclusive access to information more than a year before any other vendor knew the Grand Central location was available. The company even signed a $2 million agreement with the current tenant to vacate its space five days before the MTA issued the RFP." Apple was the only company to respond on June 27th, 2011 when the request-for-proposals were due to the MTA. Less than a month later, on August 10th, the deal was already closed and Apple signed a deal to rent the space. The MTA said it sharply disputes the premise that fairness was compromised during the negotiations. "The MTA does not typically have reason to involve itself in discussions with a potential proper like the discussions that it conducted with Apple," the agency said in the audit. "However, given the existence of the below-market Metrazur [the former restaurant tenant that occupied the space Apple is now in] lease, Metrazur's insistence that the terms of a buyout be firmly established (and financially secured) as a pre-condition to the MTA commencing an RFP to remarket its space, and the unique physical limitations of such space, this situation was highly unusual." "Although we were disappointed that no one but Apple ultimately responded to the RFP, we nonetheless achieved a superb result, and we stand behind every aspect of the analysis," the MTA's response continues.